* One of the men was wealthy (attention: Barack Obama and Jen Psaki) and owns or ran a network of cell phone kiosks across America’s East Coast. That network could easily have been used to set off a series of simultaneous attacks in malls across the East Coast, where these kiosks are usually located. Obama and Psaki keep telling us that Muslims who join ISIS do so because they lack opportunity, jobs, and money. Um, not true in most cases, including this one. Mr. Saidakhmetov, who authorities say worked for Mr. Habibov at a network of mobile-phone kiosks he ran across the East Coast and got to know him that way, posted messages on pro-ISIS websites in the months before he bought tickets to Syria, according to the complaint. Mr. Habibov appeared to be an important part of the alleged scheme because of his financial resources, according to the complaint. He accompanied Mr. Saidakhmetov to a Brooklyn travel agency to buy his airline tickets, and reached out to several contacts shortly before Mr. Saidakhmetov’s planned Feb. 25 flight to ask for funding and support for the two men in Syria, according to the complaint. In spring 2013, Mr. Habibov was a part-time student at the New York City College of Technology, school officials confirmed Wednesday. He was also living in the U.S. illegally, having overstayed his visa, according to court documents and law-enforcement officials. He lived in a third-floor apartment in Brighton Beach for a few months, according to the building’s superintendent. Yelena Yukhananova, another resident, saw Mr. Habibov on a few occasions but had never spoken with him. “He kept to himself,” she said. * The mother of one of the men knew he was probably going to try to join ISIS because she confiscated his passport. And, yet, she never told authorities, so they might never have discovered the plot. Mr. Habibov was also worried that Mr. Saidakhmetov’s mother—who had confiscated her son’s passport when she heard about his plans to go to Syria—would “raise an alarm” when she found her son had left. * The wife of one of the men didn’t even know he was/is Muslim (though it doesn’t sound like she’s a member of MENSA–maybe DENSA). Lakeisha Bailey first met Abror Habibov in 2007, when he bought her a drink at a Virginia nightclub. “He was calm, collected, laid back, very generous,” she said. “A gentleman.” They were married the following year in a small courthouse ceremony. They lived a normal life in Hampton, Va., Ms. Bailey said, going bowling, to movies and local restaurants. Mr. Habibov, an Uzbeki citizen, didn’t drink, and he never talked about religion, she said. “I never knew him as Muslim. He never did strike me as that way,” she said. * They followed Islam, were part of the organized Muslim community in New York (they openly discussed their terrorist plans in the mosque and weren’t reported by anyone), and criticized family members who did not adhere to Islamic law a/k/a sharia. 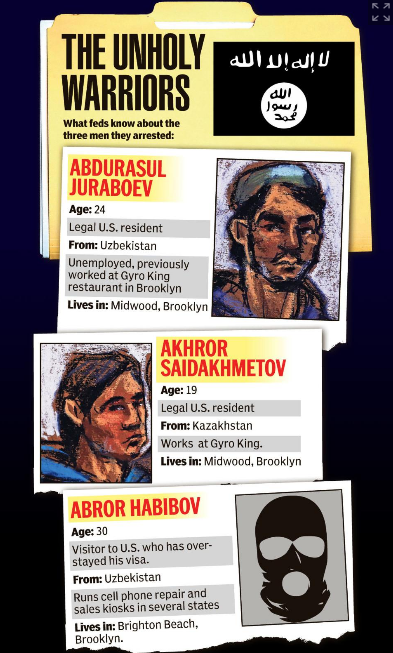 The two [Habibov and Saidakhmetov] allegedly discussed their plans at a mosque in Brooklyn, before going to the Brooklyn travel agency. . . .
Mr. Juraboev expressed dismay in recorded conversations about the “idolatry” of his Uzbekistan-based parents, and about his sisters, whom he described as “uncovered” and irreligious, according to a transcript of the conversation in the 23-page complaint unsealed Wednesday in federal court in Brooklyn. * They planned attacks on U.S. soil on behalf of ISIS, but the FBI and other law enforcement ignored their plans and opportunity (see the cell phone kiosks biz, above) to commit terrorism on U.S. soil. If the men weren’t able to travel to Syria, they offered to carry out attacks on American soil, including planting a bomb at Coney Island and buying guns to shoot law enforcement, according to the complaint. Those threats were considered by authorities to be more aspirational than operational. “Not Operational”? Really? Um, again, if you have cell phone kiosks all over the East Coast, you can easily fit those with bombs and blow up a whole buncha malls. Sounds very operational to me. And by the way, the FBI didn’t catch these guys by setting them up or from members of their mosque turning them in. Authorities only caught them because these people posted on an Uzbek-language ISIS website. Otherwise, they’d have been able to carry out their plans. And they’d have been discovered when it was too damn late. God Bless Debbie for tirelessly keeping the public informed with the truth. I find this information more infuriating than scary. That said, NYC deserves another 9/11–and this time, after the attack, I won’t go there and spend money. And law enforcement can’t profile Muslims. Obama says so. Muslim feelings are more important than infidel American lives. They’ve been in this country a couple of years now and their first loyalty isn’t to America but to Dar Islam. Sure, they were caught but only due to luck. Next time – Islamic terrorists will succeed. It’s not if we’ll be hit, it’s when. There are too many “lone wolves” roaming the landscape. Can you imagine how many of these assholes are in Metro Detroit? I’ve never seen a bigger collection of idiots. Your info Debbie, doesn’t go un-noticed. Keep informing the masses. It’s OK because if they were smart enough to be dangerous (i.e. not posting plans on website) they wouldn’t go after Obama in the first place. So don’t sweat it. He knows what he’s doing. Last week my three year old grandson ran down the potato chip isle at a local supermarket. When I turned the corner to go after him, there were three Muslims women in burkas standing there. I grabbed him fast and got out of there without the chips. No sense taking a chance of being the first in the news recovered dead in a supermarket bombing. You don’t know anymore where an Arbor, Abdurasul, or Abhrurr or their woman might be. I wouldn’t worry when it’s a group of three. In the western world getting dedicated suicide bombers who are trained well enough not to get caught by security as suspicious -wether as possible shop lifters or terrorists- isn’t that easy. You wouldn’t waste them in a one spot hit. Plus suicide bombing missions are a very tense task. One woman leaking some fragments of anxious, tense cues isn’t likely to be focused on, but three at once in that state would be registered to suss out. Your response if it was one woman re a precious grandchild -yes- better safe than sorry. Though don’t say anything to t to a kid this young why you intervened. I just realised after my last sentence certaon parallels. Like, Govt security agencies are guesstimating local terrorist risks, like you or I would at random and would be evasive over the real more complex picture. They are minimising these events so we don’t freak out and make complicated demands. Debbie’s response reflects the problem of treating adults like three year olds. It’s a sad fact of life that the more civilized a people are the easier they are to intimidate and kill. Unless of course they buffer themselves with superior technology. Drones don’t win wars though and they don’t fly by themselves. I’ll say this for Muslims and it’s the only thing I’ll say, the Germans would have had a tough time quietly rounding them up and shipping them off to an unknown destination. The other day I was listening to Michael Savage. I don’t usually listen to him because generally I don’t know what he’s selling. Anyway, this time I heard him blah, blah about how the real reason Muslims hate us is because of our decadent culture and some unconventional uses for green tea in L.A.
Once you’ve got to the stage that you start expunging your guilt in an effort to explain why this is happening to yourself in a situation like this you’ve reached a certain level of acceptance. This is part of the reason I don’t listen to Savage. He has a serious case of the wobbles. I’m never sure if his show isn’t just an elaborate parody of itself. He’s always looking for somebody strong like Putin. If he ever got a Putin he’d spend his time complaining about what it means to live under him. Islam has destroyed every culture it ever came into contact with once it reached a certain level of population. They destroyed Hindu culture and are still destroying it to this day in places like Bangladesh. Generally people aren’t prepared to fight and die for a multicultural ethos because in many ways fighting itself is antithetical that ethos. This is a real problem because Islam started off from the very beginning destroying exactly that kind of society. It gobbles them up and they are never heard from again. Excellent analysis, thatsallfolks, especially of Savage. That’s why although I’ve found him interesting at times, I have never made him a regular listen. And your handle is all too appropriate, because for the USA, it’s alltootrue. Correction to first sentence in your article. . . the three were arrested Wednesday, not indicted. The affidavit in support of the arrest warrant has been unsealed and is available to be read online (search “EDNY Complaint – US Department of Justice”). I think the FBI had all three of these guys under constant surveillance to try and identify as many conspirators as possible before arrests had to be made. Read the affidavit and judge for yourself. If anyone has law enforcement experience (I have 25 years Federal) you can read “between the lines” and know what is going on in this investigation without it being spelled out for you. I read an article today that said a Virginia man connected to Habibov was arrested on Thursday. Who knows how many more may be arrested. The three violators in this article were serious in their effort to join ISIS or do harm here in the US and they were stopped before they could do harm. It’s now officially over. Net neutrality is going to bring Debbie down. The days of unvarnished truth will soon be over in America. Soon every web site will have the visage of The Muslim-In-Chief in the top center of the home page, as The State’s approval of the content and positions of that site. This will happen even if you’re only searching the net for the best way to cook tofu. The radio airwaves will now be filled with State Approved programming, the internet, and television as well. Discussions like we have here will be gone forever. People like skzion and Skunky will be beheaded. I will be shipped off to the Brazilian cane fields to work until my spine gives out. Little Al and NormanF will be given electric shock treatments, and then forced to recite State Propaganda over the public airwaves in exchange for their lives, and . . .
I’m very serious here. I’m very frightened. Being able to shovel snow and chop ice without a break for 6-8 hours in 0-15 degree weather with no breaks except to pee doesn’t help here. It doesn’t help my extreme fears for the times we live in. Smoke rising from the land, many people dead.